MSRP or Price does not include $450 in destination charges. Go big or go home—sound like your way of thinking? If so, then step this way—we have the perfect bike for you: the 2019 Honda Fury. Motivating down the road with a 1312cc V-twin, there’s plenty of engine here. But the real statement isn’t just engine size—it’s the way this awesome custom machine looks. Long, lean and mean, stretching nearly six feet from axle to axle, this is an outrageous testimony to the builder’s art. But this bike is more than a looker. Where most customs this visually impressive are, errr, challenged when it comes to their handling, the Fury is pure Honda in this department. Which means this awesome bike is just as much fun to ride as it is to look at. UNIQUE WHEELS AND TIRES: A fat 200-series rear tire is paired with a slim 21-inch front tire, both wrapped around distinctive alloy wheels. 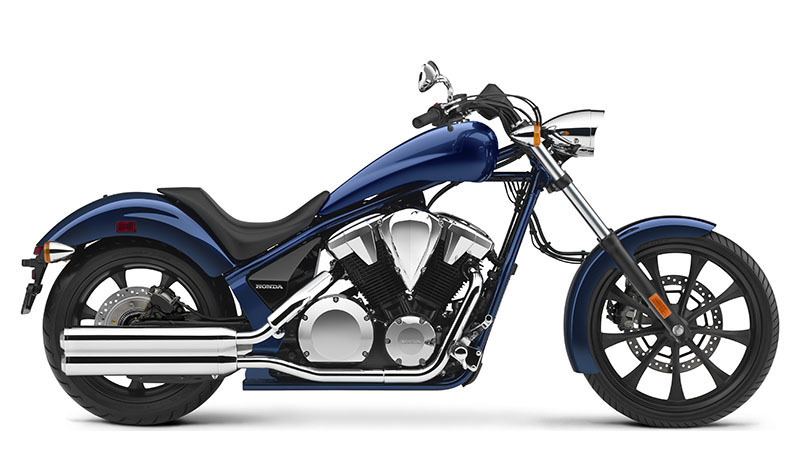 EXHAUST: The Fury’s engine features specially designed camshafts that also add to the unique V-twin sound and power-pulse exhaust sensations. SHAFT FINAL DRIVE: The shaft final drive is quiet, clean and has been uniquely integrated into the overall design. LOW SEAT: The Fury's super-low 26.9-inch seat height is an integral design element that fits in behind the slim and long fuel tank. V-TWIN ENGINE: A powerful 1312cc, 52-degree V-twin engine with a single-pin crankshaft and dual balancers has plenty of torque, and the feel only a V-twin can deliver. FUEL INJECTION: Forget about fiddling with a choke—the Fury's fuel-injection system means no-hassle startups on cold mornings or at high altitudes. CHOPPER STYLING: The Fury is one of the most authentic, radically styled custom motorcycles that Honda has ever produced. It features a teardrop seamless fuel tank, an ingenious single-shock rear suspension system and an aluminum swingarm. HIGH-TENSILE STEEL FRAME: The Fury’s high-tensile steel frame is the centerpiece to this machine’s open, minimalist chopper styling. It’s functional, too, delivering smooth ride quality and responsive handling. LONG RAKE: A raked-out front end and condensed, hard-tail look to the rear, plus a stretched wheelbase. And that long wheelbase is no illusion—the Fury stretches a full 71.2 inches between axles. BRAKES: A single, powerful 336mm-diameter front-disc brake is complemented by a 296mm brake disc in back. An ABS version is also available. Front Travel - 4 in. Rear Travel - 3.7 in. Emissions - Meets current EPA standards. California version meets current California Air Resources Board (CARB) standards and may differ slightly due to emissions equipment. ALWAYS WEAR A HELMET, EYE PROTECTION AND PROTECTIVE CLOTHING. NEVER RIDE UNDER THE INFLUENCE OF DRUGS OR ALCOHOL, AND NEVER USE THE STREET AS A RACETRACK. OBEY THE LAW AND READ THE OWNER’S MANUAL THOROUGHLY. For rider training information or to locate a rider training course near you, call the Motorcycle Safety Foundation at 1-800-446- 9227. Fury® is a registered trademark of Honda Motor Co., Ltd.